On our way to Bonn—and one step closer to a gender-responsive climate change agreement? The Global Gender Office (GGO) team is gearing up to head to Bonn in a few weeks to participate in the next round of climate change negotiations, a major session on the road to COP21 in Paris at the end of the year. Parties to the United Nations Framework Convention on Climate Change (UNFCCC) will gather in the early weeks of June to continue making progress toward the next global climate change agreement (often referred to as the “post-2015” climate change agreement), and to continue to implement programmes under the subsidiary bodies of the Convention. Importantly, too, the first substantive in-session workshop mandated by the Lima Work Programme on Gender (LWPG), decided last year at COP20 in Peru, will explore in-depth issues, strategies, challenges and best-case projects related to gender-responsive mitigation and technology. GGO made a submission to inform this workshop earlier in the year and will be on-site to participate in its sessions. Ensure collection and use of disaggregated statistics on the full and effective engagement of stakeholders, including particularly women, indigenous peoples and local communities, in their national reports for providing information on how the designated safeguards are being both addressed and respected to ensure that national REDD+ strategies enjoy broad support and are therefore credible and implementable. 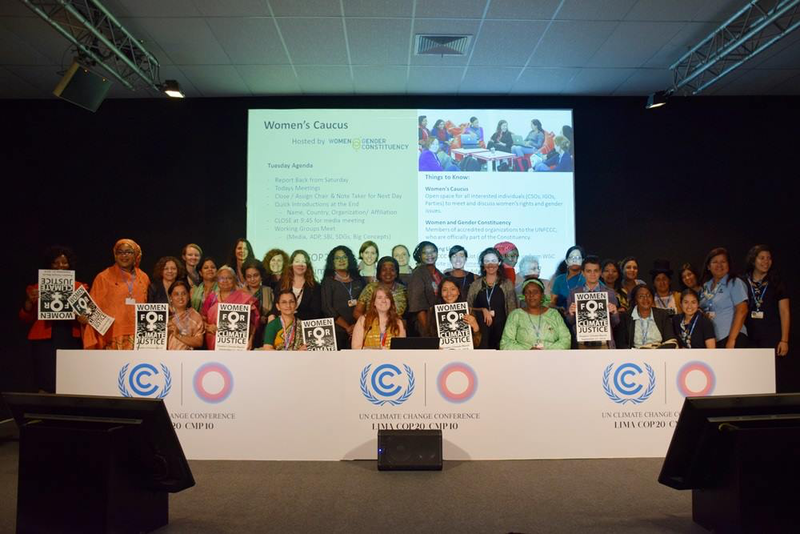 Women’s caucus celebrates Lima Work Programme on Gender at COP20 in Peru. With respect to climate finance, GGO has been proud to play an influential role in the creation and approval of the GEF’s Gender Equality and Action Plan and supports the full implementation of its Gender Mainstreaming Policy. GGO also applauds the Green Climate Fund Board members for adopting the first-ever Gender Policy and Action Plan to go into effect prior to the disbursement of funds. Enhanced guidelines and technical support will be necessary to ensure implementation, which GGO will be looking forward to supporting. With only six months to go to COP21 in Paris, negotiators can rely on GGO’s support to stay focused on and agree an ambitious, equitable and gender-responsive climate change framework. Stay tuned for updates from the mid-year negotiations in Bonn and to our wrap-up afterwards. For more information now, contact us!